Tomorrow is April and National Letter Writing Month and the beginning of another Write On challenge! 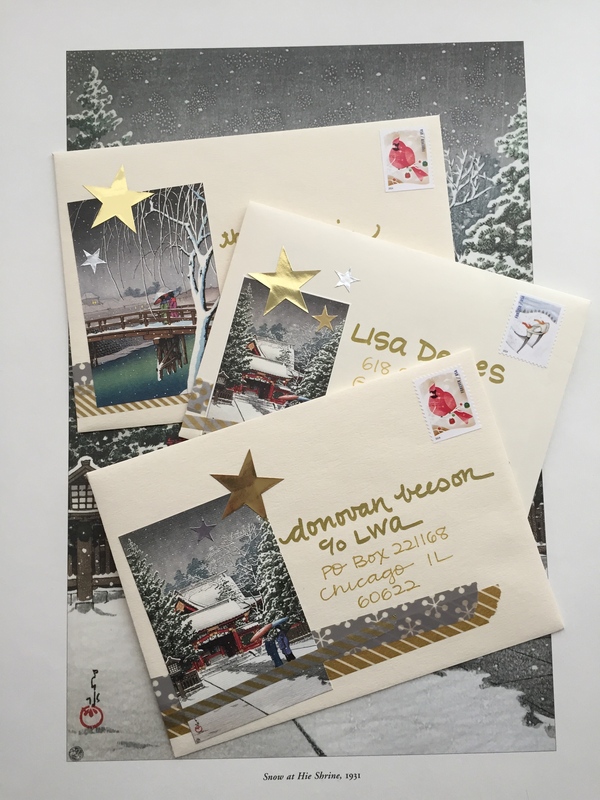 I like Write On a bit better than Letter Month because it’s more removed from Christmas card season and the expectation is looser–write 30 letters during the month of April. I’m hoping to actually finish this challenge after my failure in February. As usual, I have a nice stack of letters that need a reply, some thank yous to finish, and a drawer full of stationery. I ordered the Write On party pack again and I’m planning to have a little letter writing gathering or two this month. One of my pen pals is flying in from New Zealand so there will definitely be some letter writing time planned around her visit. Here on the blog, I’m hoping to post mostly mail related things, too. I’ve been saving some things for the most wonderful time of the year! Are you participating in the challenge? I love the kits (pictured above) this year! Those little mailboxes are perfection. I wanted to share a little round-up of the things I bought at Greer during the LWA anniversary toast. In LA, Margaret and I talked about our stationery collections/hoards and how we have enough for a lifetime of letter writing and how we try to impose buying moratoriums on ourselves…yet we still buy. It just means I need to write more letters more often. I am running low on my Original Crown Mill stationery (a lovely grey cotton paper and envelope set) so I decided to replace it with some classic white cotton paper. And at the register I snagged a “Stationery not stationary” key tag. (I couldn’t find this exact one online but how great is the “Stationery maven” one?! I want that one now too!) Donovan and Kathy both suggested this Mnemosyne paper. It’s a top spiral notebook with perforated grid sheets of the smoothest paper I’ve ever felt. Of course it’s made in Japan. Like I mentioned earlier, the paper is great for fountain pens and other pens. (I mostly use gel pens and LePens in my letter writing.) And…pencils glide across this paper like butter…sigh. If you are my pen pal, you may be receiving a pencil written letter soon. I had Naoto translate the yellow introduction page for me and he basically summed it up in a rough translation as “Great for creative expression, tool for group discussion, easy to carry in a purse, and good for capturing inspirations while you are out and about.” I think that’s why Donovan likes it so much–she’s an on-the-go letter writer! And I fell in love with these flat cards from Cheree Berry. It’s a super-thick letterpressed card with a tiny extra card and envelope for a little P.S. message. Genius, right? I am in the middle of a giant desk clean out. My living room is a mess of stacks of mail, stationery, greeting cards, pens, paper…all in the name of getting rid of some stuff and getting the desk organized better. No visitors please…but maybe I’ll share pictures next week…or next year when I get it all done. Oy. I was so excited for my trip to LA, obviously to celebrate the LWA, but the cherry on top was a visit to the Paper Pastries shop. I’ve ordered online before and some wonderful friends have sent me Paper Pastries gifts, so seeing it all in person was a delight. Paper Pastries is filled with the sweetest stationery, gifts, wrapping paper, pens, rubber stamps (that Margaret designs and makes in house,) and one of the most incredible selections of indie greeting cards I’ve ever seen. Most of the shop consists of independent artists’ and designers’ work, which always makes for unique finds! Look at all of the fun greeting cards! There are tons of letterpressed options and most have bright colors and funny or cheerful greetings. There’s even an entire section of CAT CARDS! Pictured above (on top of one of my favorite (now discontinued) donut papers from Snow & Graham) is what I bought at Paper Pastries: sushi stickers, a travel journal, a neon notepad, greeting cards, a cat stationery set, rubber stamps, resistance postcards, and a postage stamp pin. 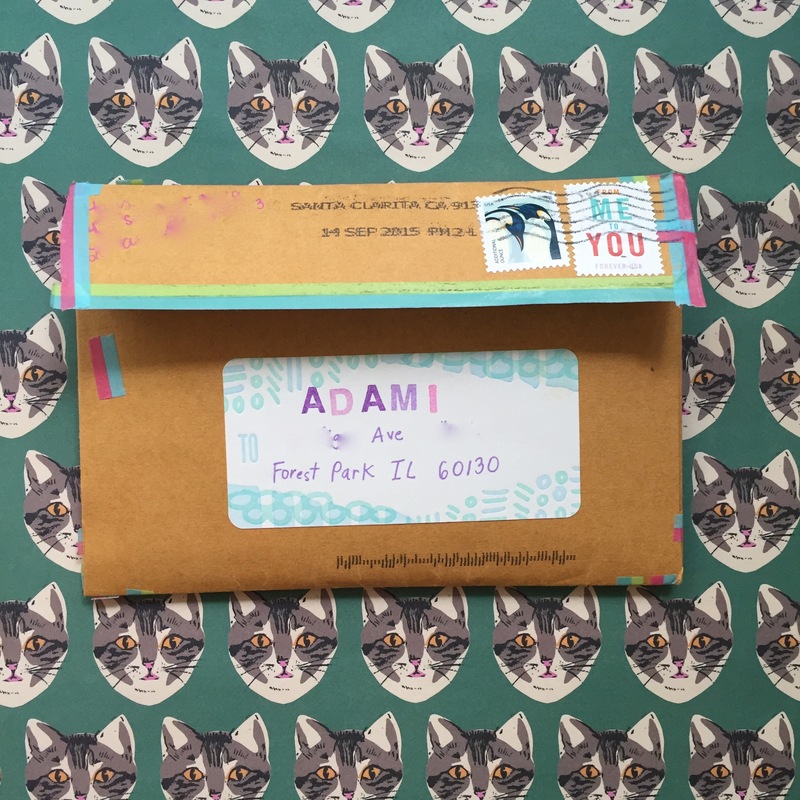 I’ve been sending a lot of neon mail this summer, but I think cat mail may be the next trend!! Stay tuned! 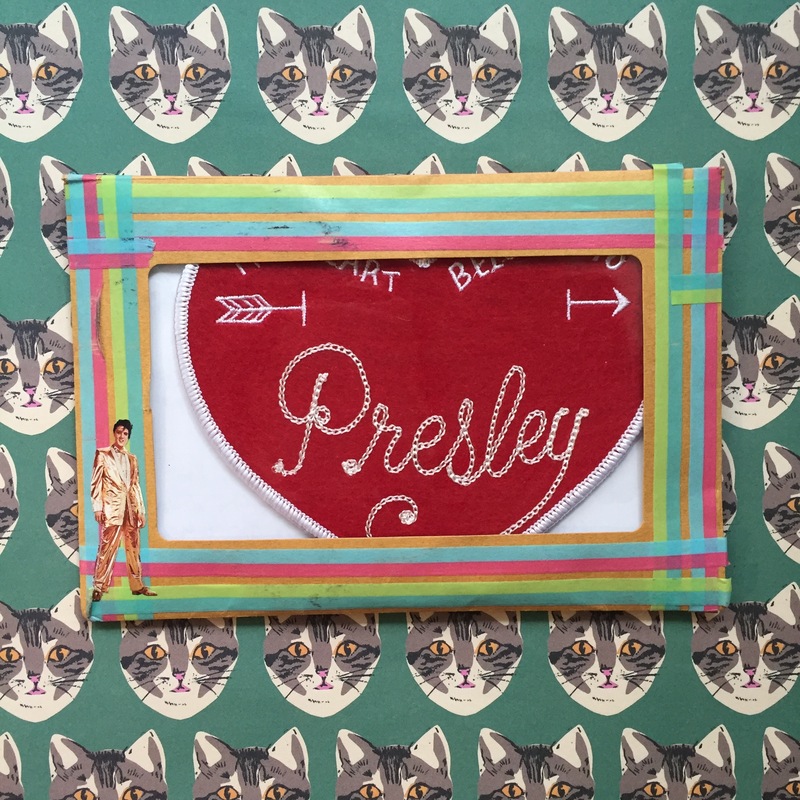 Margaret sent me the best mail last month–a Presley patch in a Midori Kraft Window Envelope adorned with an Elvis sticker!! She hit all of my favorite things!! Margaret loooooves Presley. (Presley loves Margaret, too!) 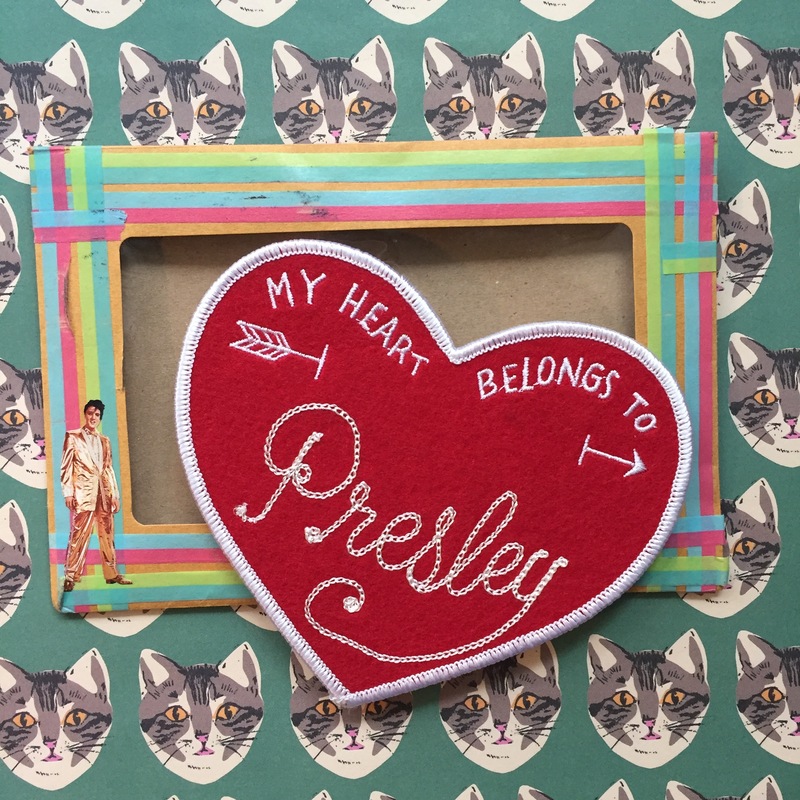 Margaret said she couldn’t resist getting this custom patch from Tuesday Bassen (Link is to a similar one because the “My Heart Belongs to” version was a limited edition, see Margaret’s comment below.) at the Whurl & Friends Shop ‘n Pop. I love this patch! Think of the possibilities! You could get your own pet’s name, or your partner’s name, or your favorite snack. (“My Heart Belongs to Hot Dogs.”) Perhaps mail lovers need a “My Heart Belongs to Letters” or “My Heart Belongs to the USPS.” And in true Margaret fashion, the patch came in the sweetest package. She addressed it on the flap side so that the patch could be seen clearly through the window. The label is letterpressed with the turquoise design and Margaret hand-stamped my name. Thin washi tape sealed it all up. I was delighted to find it in my mailbox. Thanks, Margaret. P.S. Did you know today is World Post Day? On January 1st, I spent the day catching up on all of my mail. I sent out a big stack of seventeen New Year’s cards and thank yous on the second. 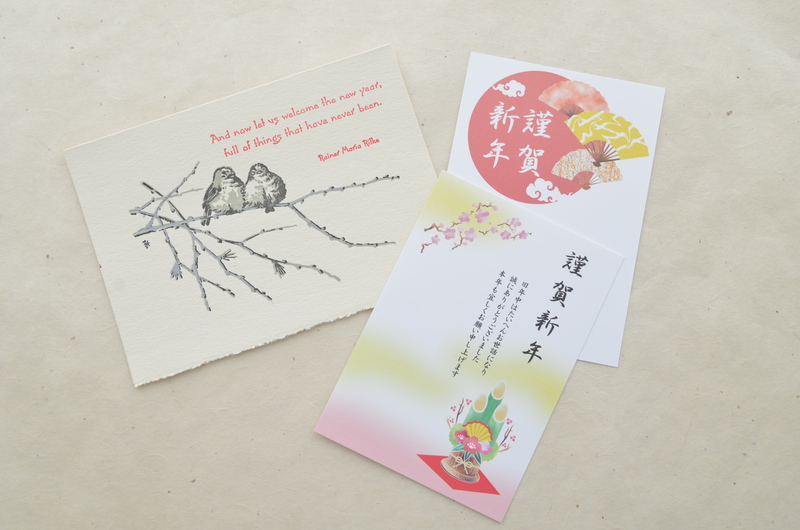 For New Year cards, I sent three different versions–two different Japanese postcards and letterpressed greeting cards. We got the Japanese postcards at Mitsuwa again. Roughly translated, the fan one says “We humbly wish you a happy new year” and the bamboo one says “Thank you very much for all assistance rendered the previous year. We ask for your continuous guidance this year as well.” The little bamboo drawing on the bottom is a classic Japanese New Year symbol called a kadomatsu. 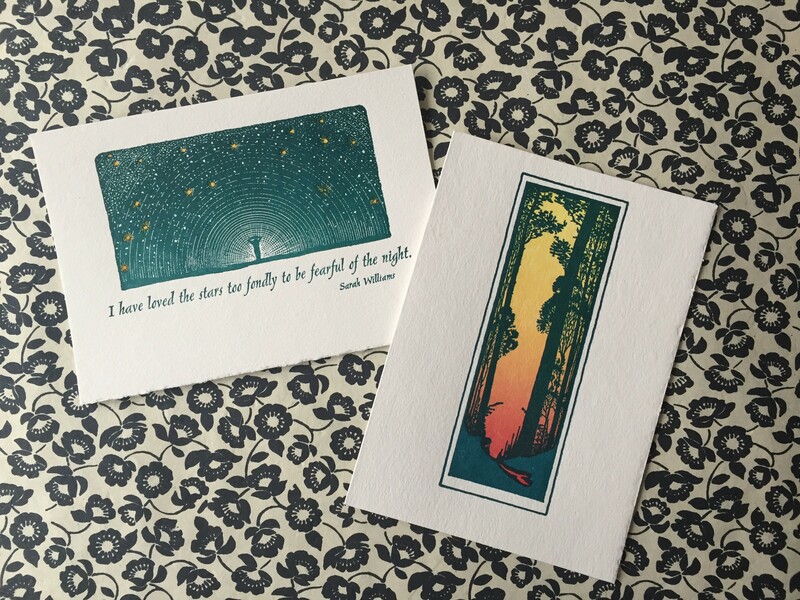 The greeting cards are from Saturn Press, a letterpress printing company in Maine. (They don’t have a website, but I found some information about them here, which I think is quite interesting.) The card features two juncos sitting on a branch and the quote by Rainer Maria Rilke, “And now let us welcome the new year, full of things that have never been.” I love everything Saturn Press does, but these are my favorites–from the birds to the simple phrase and the gorgeous paper stock with its deckled edge…these cards are dreamy. I put all of the cards in envelopes (even the postcards) and decorated them with washi tape, metallic stars, and old Japanese Woodblock Cavallini calendars. (I had several in my stash, so I picked out the wintry months to use. Cavallini uses artwork by Hasui Kawase, the same artist who was on our Christmas cards.) 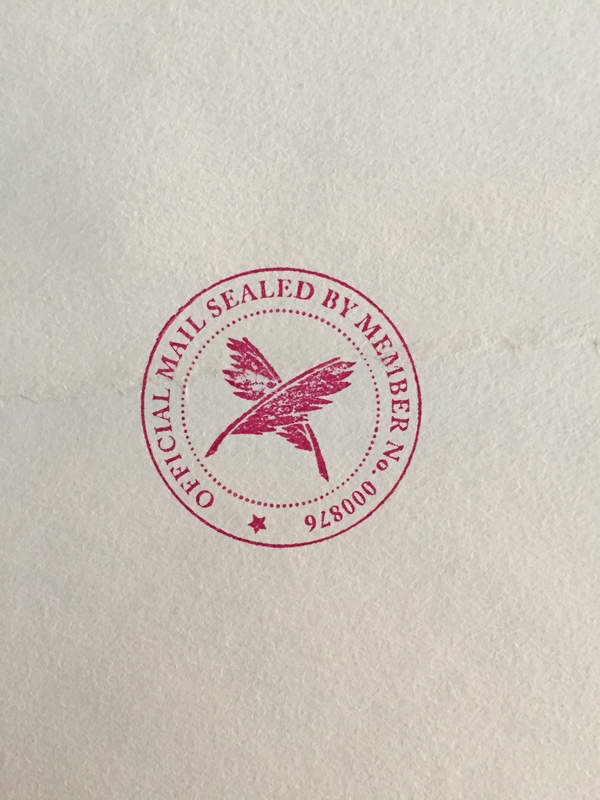 And to seal the deal, I got to use my shiny new Letter Writers Alliance member stamp. It feels good to start the year out with a stack of mail…let’s hope I can keep up the postal momentum!